Sleeker than most toilet brushes, the Good Grips brush from OXO stays upright and concealed in its own clamshell canister when not in use. It's attractive enough that this is one cleaning utensil that won't need to be hidden away. The flexibility of the handle enhances cleaning at any angle, while the egg-shaped knob at the top keeps the brush steady and easy to grip when extra pressure is needed. 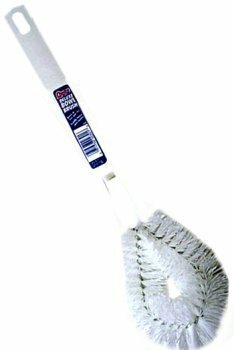 Keeps your toilet brush neat andamp; hidden. Comes complete with holder andamp; brush. Features a stylish Dalmation design. One-piece brush and lid with plastic inner tray. Made of stainless steel for rust-resistance. 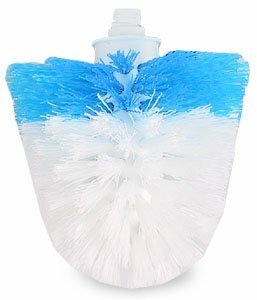 "Kills Viruses, Bacteria, Mold & Mildew"
This uniquely designed toilet bowl brush combines organization and style with everyday essentials. Constructed of high strength ABS plastic. Design recognized by the Museum of Modern Art. Holder conceals brush when not in use. White plastic; brush is 5" dia.x14-1/2"H.
Features elegant, long lasting porcelain construction. Is decorated with beautiful porcelain roses. 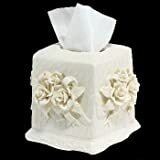 Fits a standard, square tissue box.